Home » Latest News » Not using EasyTeir on your V7000? Not using EasyTeir on your V7000? Covenco explore the ways in which the V7000’s EasyTier function can maximise the efficiency of your storage environment. Storwize V7000 includes IBM System Storage Easy Tier, a function that responds to the presence of solid-state drives (SSDs) in a storage pool that also contains hard disk drives (HDDs). The system automatically and non disruptively moves frequently accessed data from HDD MDisks to SSD MDisks, thus placing such data in a faster tier of storage. 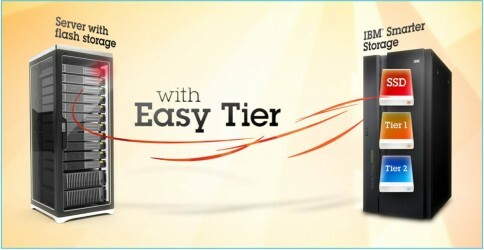 Easy Tier eliminates manual intervention when assigning highly active data on volumes to faster responding storage. In this dynamically tiered environment, data movement is seamless to the host application regardless of the storage tier in which the data resides. Manual controls exist so that you can change the default behavior, for example, such as turning off Easy Tier on storage pools that have both types of MDisks. Generic SSD tier: The SSD tier exists when SSDs are in the storage pool. The SSDs provide greater performance than hard disk drives (HDDs). Generic HDD tier: The HDD tier exists when HDDs are in the storage pool. All MDisks belong to one tier or the other, which includes MDisks that are not yet part of a storage pool. If you create a storage pool (managed disk group) with both generic SSD MDisks (classified with the generic_ssd option) and generic HDD MDisks (generic_hdd or default option), EasyTier is automatically turned on for pools with both SSD MDisks and HDD MDisks. So the message is clear. EasyTier makes full use of the speed and capabilities of your SSD drives allowing you to access your most frequently used data in real-time, whilst maximising the use of your other disk storage for all other data used on a daily basis, but less frequently. The V7000’s EasyTier function is a key feature of this technology. If deployed intelligently with understanding of the key operations of the business you can create a more cost effective storage environment by utilising your more expensive SSD where its needed most. This entry was posted in IBM, Stock Offers, Storage and tagged #easytier, #ssd, #v7000. Bookmark the permalink.